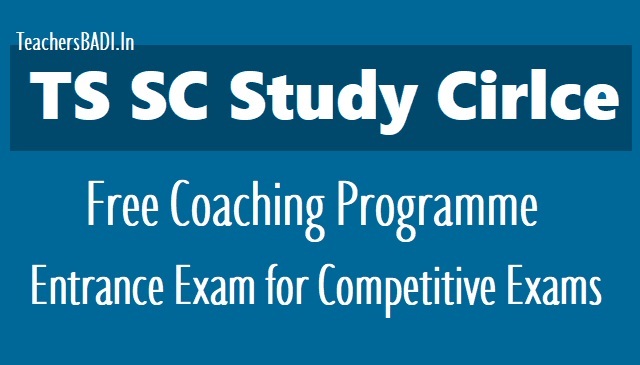 TS SC Study Cirlce Free Coaching Entrance Exam 2018 for Competitive examinations: TS SC Study Cirlce Free Coaching 2018 for Competitive examinations to to SC, ST & BC communities. TS SC Study Cirlce (Sponsored by Dept. of Scheduled Castes Development, Govt. of Telangana) has given the notification for 5 months Free Coaching for various competitive examinations. The SCD Dept. is arranging free coaching for (5) months to impart coaching for various competitive examinations like Group-I, Group-II, Staff Selection Commission, Banking Probationary Officers and Clerical examinations, Sls and Constables, RRB, its related jobs notifications, & Group-III & IV and allied examinations in (10) districts of Telangana State Scheduled Castes Study Circle branches through Telangana State Scheduled Castes Study Circle, Hyderabad, nodal agency to SC, ST & BC communities for (100) candidates from each district mentioned above (10) Districts of Telangana State, for which, online applications are invited from eligible candidates who possess any General Degree from 27.04.2018 and the last date for receipt of applications is 15.05.2018. The date of entrance test is on 27.05.2018 and the coaching programme will be organized from 18th June, 2018 to 17th November, 2018. 3% to Physically challenged persons shall be reserved. The process of selection of candidates is only through the entrance test conducted by the T.S. Study Circle. Among those selected candidates are classified according to the choice of their coaching on the basis of number of candidates opted for each coaching programme / course. Centres will be designated for offering the particular course and the candidates should be prepared to go to other than their native districts. Wherever, there is a need, we may arrange the centralized online coaching in the districts. The pattern of question paper for entrance test is of objective type with 100 questions consisting of General Studies (55) marks, Aptitude and Logical reasoning (45) marks. The General Studies includes Economy, History, Polity, Environment, Ecology and Culture which covers both India and Telangana. The question paper for the entrance test will be in both English and Telugu versions which is for 100 marks with two hours duration. The date of entrance test is scheduled on 27.05.2018 (Sunday) between 11.00 AM and 01.00 PM at respective (10) above mentioned districts. e) A candidate should also be eligible as per the norms prescribed by the organizations like TSPSC, Banking Services, RRB, SSC etc., with regard to age etc. f) The candidates who have taken coaching earlier either in any of the district branches or Hyderabad main branch other than short term courses are also not eligible. For any further details please contact the Honorary Directors of respective (10) districts. S.No. Name of the District Officer Phone No.